I apologize for the delay in updates but NHA has been very busy. I thank you for your donations and please keep spreading the word. 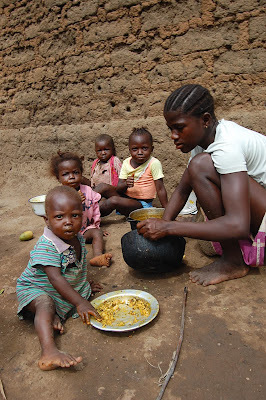 We must involve everyone we can in making a difference in the lives of those who have NOTHING. Those we serve in Sierra Leone are in a critical stage of need and we must do all that we can to come to their assistance. There are many souls suffering of hunger, illness and other poverty related situations -- Nazareth House is their only source of aid. I am happy to report that we have successfully obtained medications to treat internal parasites, which is a great accomplishment. The school building in Kabala has only a few incidental construction ends to wrap up before it is totally completed. This is going on as you read this. 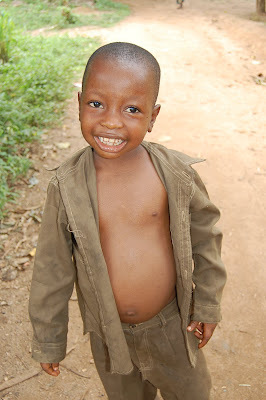 The children are currently being measured for uniforms and we have raised enough for 85 students to be clothed so far. Less than Two hundred more to go...sigh...don't despair, we can do it! Our children at the school have so very little clothing, this is such a great gift for these children to receive as they start the new school year in a brand new building- a gift from the Nazareth House Family - all of us working together to provide. 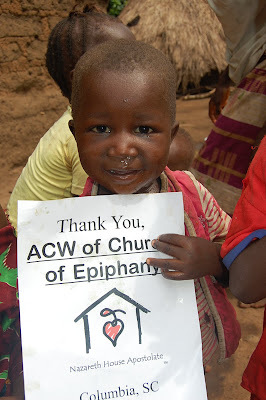 $25 provides two uniforms per child. This alleviates the child from wearing the same uniform all week long in scorching heat or in the down-pouring, mud-soaked rainy season. 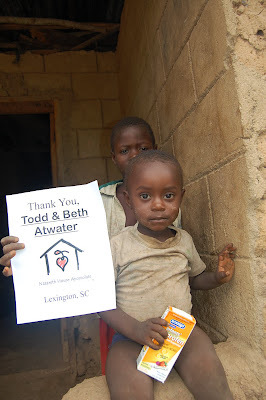 Each donor will receive a picture of the child in which they provided a set of uniforms. A special thank you to Addresser Based Systems in Cincinnati who donated 20 uniforms. Have you asked the Company you work for or your church, or social organization if they'd like to donate a few uniforms???? NHA welcomes the latest addition to the Nazareth House family, The Church of The Holy Comforter, Montevallo, Alabama. 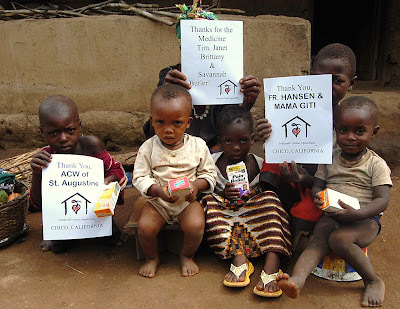 Now that we have a good bit of the supplies on hand; we must personally deliver them to St. Laurence House in Freetown. Many items are being shipped, but the desperately required items must be walked in and it is now time for us to go. We are presently collecting for travel funds and on the ground "cash". On the ground cash enables us to fill a need as we happen upon it, i.e. if a family has a leaking roof, we fix it. It allows us to provide staple household goods, food and whatever the need for those in our path as we search out those living in the cracks...hidden from most humanitarian aid supply. I have found some cheaper airfares that hopefully (if we collect fast enough) we can take advantage and save a lot. Airfare has been running about $5,000 per person (fuel costs have risen, of course) but I have found much better deals if we act fast. In fact, if I had $3,500 today, I could book both of our flights and that would cover it!!!! A $6,500 difference in travel costs!!!! I know that I am always asking for money and I apologize for that...but I must continue. Lives are at stake. For every pair of begging eyes that flash over and over in my heart, my soul and my dreams at night - I will continue. If I had a million bucks I'd do it all myself, but I don't, you don't and therefore we must all pull it together little by little - each giving as they can. The people we serve have so little and we have so much in comparison. Raising funds is the fuel of humanitarian aid. It is what makes possible the gift - a gift of hope. We can make a difference, we can change lives -together! Give today! 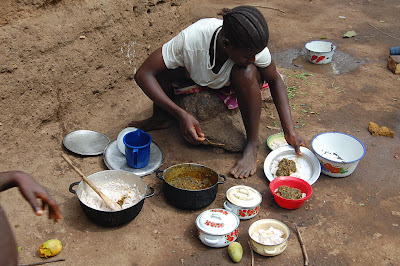 Can you imagine fixing dinner in the conditions as the lady in the photo above is doing? ?